I am a scientist at heart, with an undergraduate and graduate education in Chemical Engineering. Coming out of university, I spent almost 20 years as an Engineering Manager at The Procter & Gamble Co. Yes, I made soap! While located near Cincinnati, Ohio, my job took me all over the world, including a two year stint in Brussels, Belgium. When offered the opportunity for (very) early retirement a few years ago, I took the offer in order to focus more time on my family and my other interests. As for family, I am married to my college sweetheart of 30+ years ago, and we have two children; a daughter studying MicroBiology in college at Denison University and a son finishing his last year in high school. As for interests, I enjoy reading, computer programming (Python), golf, and…of course…astronomy. As a child of the 1960’s and 70’s, I was of course caught up in the grand excitement of the Apollo, Skylab, and eventually Shuttle eras. One of my earliest memories was watching live as Neil Armstrong took that famous first step on the moon. Like many kids, I dreamed of being an astronaut, but – also like many kids – that dream morphed over time as life’s realities set in. Rather than going to space, I settled for looking at space through my early telescopes. My very first was a small Edmund Scientific refractor, painted bright red…what could be cooler! I enjoyed the views of the planets, the moon, and (after buying the proper filter) the sun. I graduated to a Meade ETX-90 and enjoyed the same views…only a little bigger and crisper thanks to the improved optics. Then life again got in the way…job…travel…other priorities…and my telescope gathered dust in the basement. 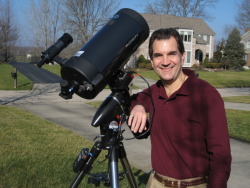 When I left P&G, one of the first interests to be rekindled was astronomy. Thanks to a (very) generous birthday gift on one of those landmark years (I won’t say exactly which, but it rhymes with “nifty”), I received an Orion Mak-Cass 7” reflector…and more importantly…I finally got a decent GEM mount! Wow…talk about a leap into the space age! Even as a relative novice to the hobby, I was soon grabbing shots of Saturn showing ring detail, and banding on Jupiter, and crater details on the moon. Then I turned my attention further out and snagged the Orion Nebula, and the Pleiades. Looking further out, I captured my first deep space object: Andromeda. At that point, I was hooked! By desire and current work necessity, I am a very early riser…which makes it quite the challenge staying up until wee hours of the night with my telescope. Given building and physical restrictions here at home, I have no option to install a fixed home observatory, so I found myself night after night spending as much time setting up and aligning as was available for observing and imaging…before tearing it all down to go to bed. And on those good nights when I did manage some images, I was unfortunately rewarded with heavily light polluted results. I searched for a better solution…and stumbled into iTelescope. Like many, I started with T3 and the free trial…and was instantly rewarded with results vastly better than my home rig had produced! I immediately joined iTelescope and began to explore all that the telescopes in NMS could offer. Again…I was hooked! Why an Affiliate via T24? Faced with my challenges at night here at home, I had already been considering the possibility of remote telescope hosting. I enjoyed my sessions with iTelescope so much that I quickly responded to a notice I saw in one of the newsletters about the possibility of getting more involved with them through an affiliate relationship. After some discussions, we developed a win-win-win proposal: installation of a telescope on the iTelescope network, giving me access via a true expert provider of remote technology; by going with a 24” Planewave, providing the iTelescope community with access to what will become the largest OTA in the NA network; and by locating it in California, providing the entire community with more than one option in NA for those troublesome weather nights. The plan for T24 was born! While it does not directly relate to my efforts at iTelescope, my astro-bio would not be complete if I failed to mention my other big passion: the Sun. I find our nearest star both fascinating…and convenient for someone who likes to sleep at night! Soon after getting my 7” Mak-Cass, I bought a solar filter for it and was captivated by the amazing views of the sun spots. Not long after, I made a significant investment in a Coronado SolarMax II 60mm hydrogen-alpha telescope…and was stunned by the level of detail I could pick up on the surface and prominences. I retrofit the Coronado with a better focuser (to allow remote focus and imaging from inside…and out of the blistering summer heat) and have spent the last couple of years experimenting with different techniques to tease out interesting views of our Sun.